Backstamps .... the Duck Egg Blue has Vitrified on the base and the 7 shows it was made in 1967. From the third picture I hope you are telling us you have a whole matching trio. Could I trouble you for a few measurements? For the cup: height, top diameter, diameter of the foot ring. I'm also keen to know whether the saucer is also slightly smaller than the earthenware version, so height and outside diameter, of the that would be good too. I'm looking forward to more surprises from you! What are the chances you have a spare cup? Hi fi, I'm sorry I only have the one and only cup. I just love it too! Duck egg is quite possibly my favourite colour, and I have quite a fair bit of it! I was stoked to complete a trio with the matching stamps. Jeremy - no worries, I will take some measurements for you tomorrow. Oh it's so nice to be able to talk about Crown Lynn and how great it is here. My friends all think I'm nuts when I'm raving about some fabulous thing I've found...! I particularly like that your tulip has not just one but two Crown Lynn marks on it. fi, I thought I had something for you on trademe, and then my brain kicked in! As the seller says it "might be rounder" than a tulip, and the handle is different, and it is unmarked, and it actually looks like teal to me, rather than the advertised duck egg. I have been drawn to teal this last week and was rather taken with it, so I got confused. There are currently ads for Duck Egg that is Teal, and and Teal that is Tango Blue! Thanks Jeremy, that is a FATBUM cup and looks like teal to me too. Can get quite confusing on Trademe with descriptions of colours.... especially the khaki, olive, avocado army green lol Think I counted about 24 different colours available in the tulip, maybe 25... be nice to have them all one day. fi, I thought it looked a bit like a fatbum, or South Pacific cup, as we are now supposed to refer to them, but the photograph made it look shorter than the adjacent tulip. And I couldn't get the handle to look the same as my only example of the shape. 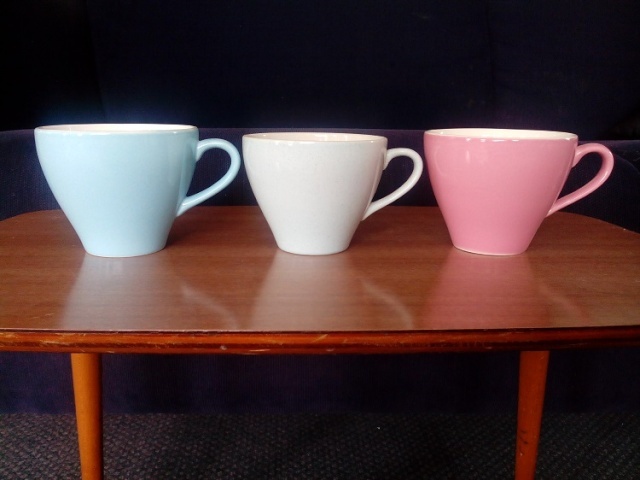 Photographing cups from different angles can change the apparent shape, and a little bit back or forward can change the relative size. I prefer them photographed in profile so the whole of the handle can be seen. 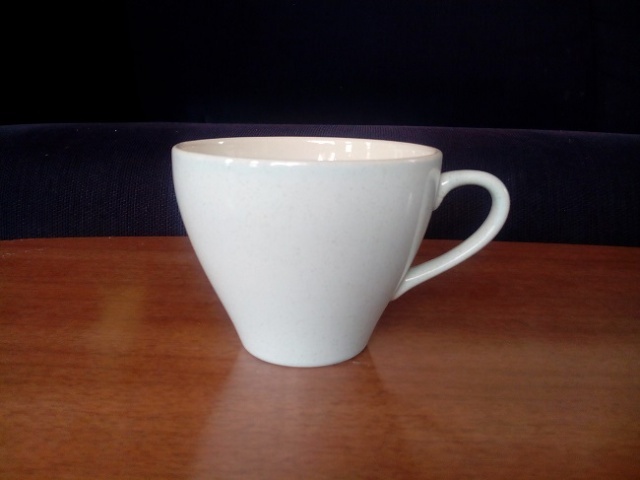 After seeing your extensive range of vitrified cups I see why you were so excited by leish's vitrified tulip. Cups are harder to find than mugs in the op-shops in Whangarei but I will keep an eye out. 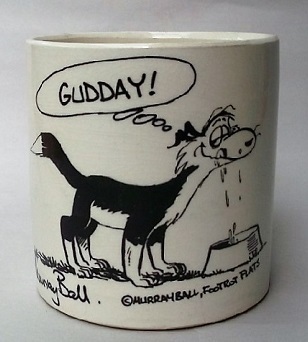 I'm new to cups and don't need to start new collections when others like you have gone so far and are willing to share them on the forum. fi wrote: Thanks Jeremy, that is a FATBUM cup and looks like teal to me too. Can get quite confusing on Trademe with descriptions of colours.... especially the khaki, olive, avocado army green lol Think I counted about 24 different colours available in the tulip, maybe 25... be nice to have them all one day. Hi fi, funny you should say that about wanting all the colours - I have just emailed the site a photo of all my tulip duos / trios laid out and I think I have 25 different colours not including my floral tulips. I don't have the matching saucers or sides for a few but mostly I do! I'm bad... I would love a trio in all the pretty colours they came in. Hee hee!!!! A lovely collection Leish!!! I am not sure the colours exist in all 3 pieces so will be exciting to see if you ever find them. .... ( like an orange plate!!) I have a mountain of colour glaze saucers spare that I sell for $1 each as they have crazing.... if you want anything let me know. Thanks so much fi. 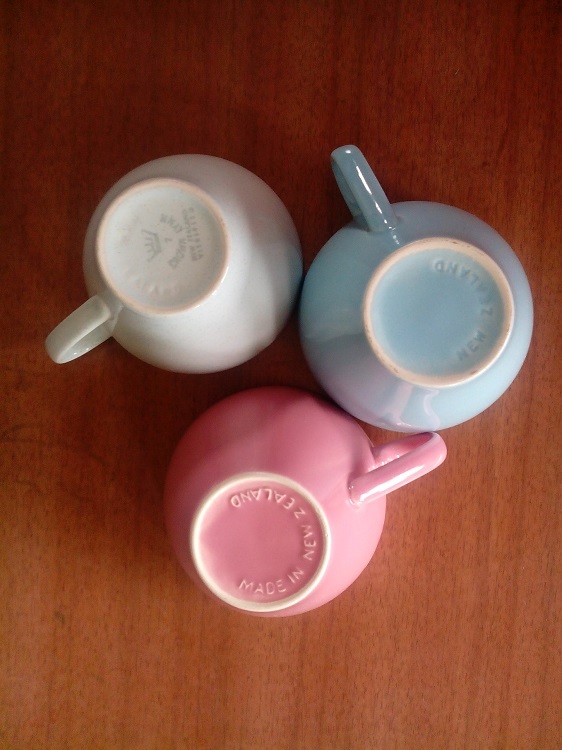 A friend of mine who also collects Crown Lynn trios told me which colours do/don't have saucers and sides to match, and which came with patterned saucers as opposed to the matching coloured ones so that I knew what to look out for. Thought we had it all sussed, until that auction came up a while ago on Trade Me for an egg yolk entire trio! Until then we had thought that the egg yolk tulip only went with the Topaz pattern. So you never know when you'll be proved wrong. Jeremy - I've just realized that I haven't measured that saucer and side plate for you. Will get cracking now! Jeremy - here are the measurements for the duck egg tulip and saucer. My apologies for the delay. Ev, just wondering whether perhaps this should be a 3636 "Light weight cup " as the date on the base is 1967. I know the 781 number remained in use after 1964 but did the 863? Maybe it could be both in the gallery? I wondered about that too Jeremy, but there are no dates for the 3636 and the previous dated was 3631 first made 1979 and the next dated is 3639 first made in 1983. Could use this as a surrogate shape as it will be the same and won't have changed will it? So it is without a doubt genuine 781, even at 1967. Unless they stopped making duck egg blue about 1979-1983 it should be a good space filler for 3636, but as you say, they are the same shape and it is a shape gallery after all. The 781 was a long time coming. Who knows when a cast-iron-guaranteed 3636 will appear. Please excuse my slip, I was just scanning for a three digit number and picked the wrong one. From here on please take your time and don't forget to breathe. Following the listing of actual production dates above we have another issue. I was very pleased with myself for providing the 3635 and 3638 but a production date of 1971 for number 3631 tells me that those two cups, respectively dated 1967 and 1965 cannot be right. Works for a nominal changeover date of 1964 for four digit numbering but not actual production dates. It does not help that the descriptions for the 755 specifies earthenware, and that for the 700 does not specify the body material at all! I may have a partial fix coming. You may notice that the "CCC" cup appears to have a slightly different handle from the 700 and what I have thought to be a 3638. The measurements the seller gave me are correct for 700s etc. Maybe this will be a guaranteed 3638! Back to the 755/3635 Carlton Cup, I have not found an alternative three digit number for a vitrified cup in this shape. 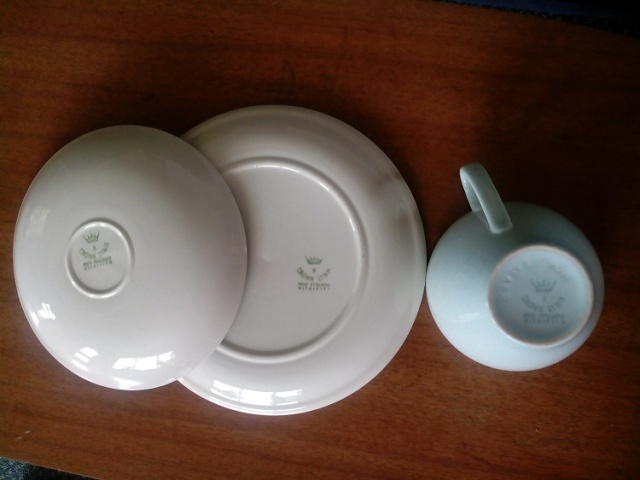 It doesn't help that the 700s cup numbering APPEARS to include both earthenware and vitrified ware, such as the 782 Cook & Serve coffee can. That poses yet another problem as the 782 becomes the 3022, which as you can see is not a (3600s) vitrified number. Oh dear, I can't breathe ....... overwhelmed ...... one at a time please OK!